Hier buchen Sie direkt beim Vermieter ! ! 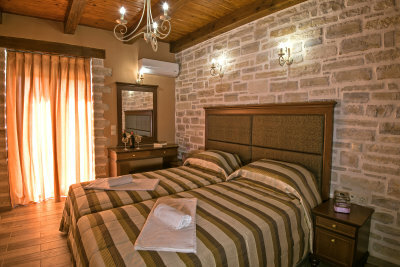 Private Stay Accommodation - Villa Semeli is listed at privatestay.com. Das kleine Kretische Dörfchen Asteri, ca. 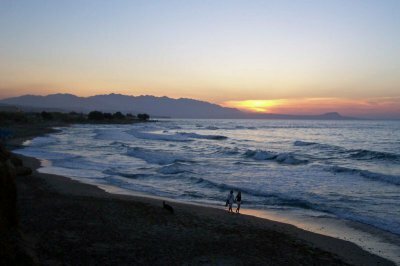 50 Einwohner, liegt im Bereich Sfakaki Stavromenos, 14 km östlich von Rethymnon, ein wenig im Landesinneren, 73 km westlich vom Flughafen Heraklion in den Hügeln + Olivenhainen des Nordküstenbereiches vor der Kulisse des Ida Gebirges . Die nächsten Sandstrände in Sfakaki sind von hier aus nicht ganz 4 km entfernt. Auf einem Hügel, 300 m oberhalb des Dorfes liegt auf 4000 m/2 großem Grundstück das 167 m/2 Haus mit 40 m/2 Pool (mit separatem Kinderteil) , Grillplatz, Sonnenterasse mit Liegen + Sonnenschirmen, Parkplätze. 8 Gäste können hier Urlaub machen. Heizung für den Winter vorhanden, Kosten 20 EURO pro Tag. Zur Ausstattung gehören im Erdgeschoss : 1 großer Wohnraum mit Eßbereich + Kamin, der in die offene Küche übergeht, 1 Doppelzimmer für Gehbehinderte und Rollifahrer möglich) , 1 Bad mit Dusche + 2 Balkone. Im 1. Stock sind 3 weitere Doppelzimmer, 2 Bäder mit Wanne, 1 Terrasse + 1 Balkon. Klimaanlage in allen Schlafzimmern im Preis inbegriffen (gegen Gebühr in den anderen Räumen) , Babybett gegen Gebühr vorhanden. 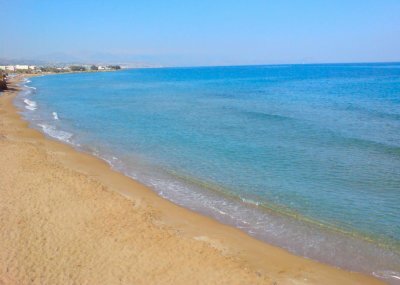 The tiny village Asteri, about 50 inhabitants, is situated in the hills and olivegroves of Northcoast area on the island of Crete,14 km east of Rethymnon town, 73 km west of Heraklion airport and 4 km to the beaches of Sfakaki. 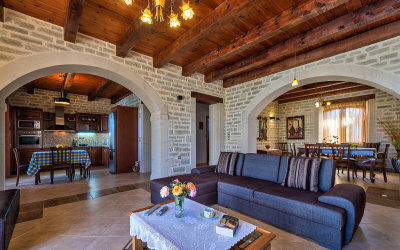 At a hillside, only 300 meter above th villagecenter at 4000 m/2 ground you find in a garden inside the olives the 167 m/2 house for 8 people with 40 m/2 pool, barbeque, sunterrace with umbrellas and sunchairs, of course also a parking for your car. 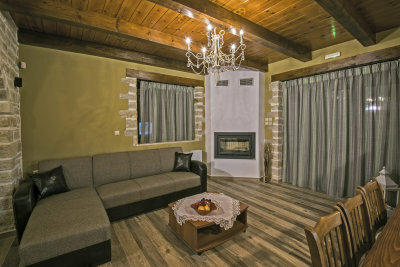 Heating system (at extra local charge) for winterholidays and aircondition (included in bedrooms) in all bedrooms are available,babycot at extra local charge, pets are welcome. 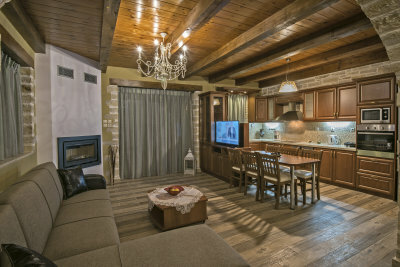 On the groundfloor you find the large living area with chimney,SAT TV and a dining area, as well as the open well equipped kitchen , dishwasher and washing maschine available. 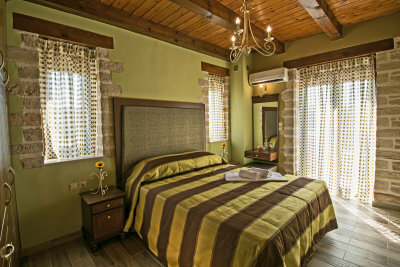 There is also 1 double room and a bathroom with shower, so that this ground area is also suitable for disabled guests with wheelchair. 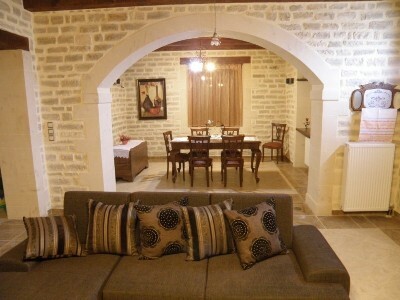 2 balconies, one belonging to the bedroom and another one in front of living area are available. 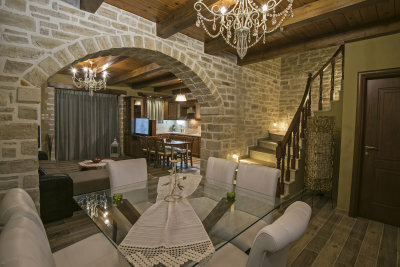 In the 1. floor are situated theother 3 double rooms, 1 with balcony, theother with terrace and 2 bathrooms, one with shower theother with bathtube. WLAN for your LAPTOP code available free. 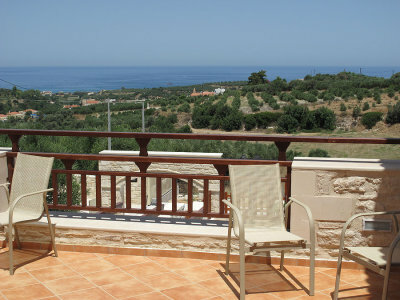 From the house there is a nice view to the mountain area in the back, the surrounding of the village with its olivegroves and down to the sea. In the village there are 1 traditional restaurant, 1 cafenion and a minimarket. 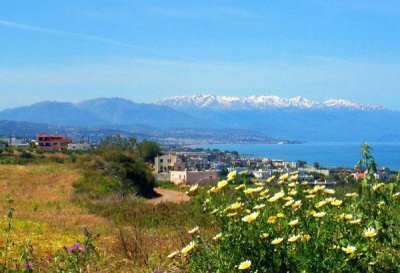 In a distance of 2,5 km you find traditional Cretan restaurants, 2 supermarkets, baker, pharmacy and a petrol station. Das kleine Kretische Dörfchen Asteri, ca. 50 Einwohner, liegt im Bereich Sfakaki Stavromenos, 14 km östlich von Rethymnon, ein wenig im Landesinneren, 73 km westlich vom Flughafen Heraklion in den Hügeln + Olivenhainen des Nordküstenbereiches vor der Kulisse des Ida Gebirges . Im Dorf gibt es ein landestypisches Cafenion, eine traditionelle Taverne und einen Minimarkt. Weitere Einkaufsmöglichkeiten, Bäcker, Apotheke, Supermarkt, Tankstelle, typische Familientavernen, in 2,5 km Entfernung im Bereich Sfakaki. Das 140 m/2 große Haus liegt im unteren Dorfteil im Bereich der ausgedehnten Olivenhaine, die den Ort umgeben, auf einem 1000 m/2 großen Grundstück, und ist gut 2,5 km entfernt vom 1 km langen, flach abfallenden Sandstrand von Chrisi Amo in Sfakaki. Es eignet sich für insgesamt 6 Gäste ( + 1 Baby unter 2 Jahren geht auch noch) und hat insgesamt 3 Doppelzimmer ( alle mit kostenloser Klimaanlage), eins in Parterre, die anderen beiden im 1. Stock. Hier gibt es auch eine 20 m/2 Terrassen und 2 Balkone. 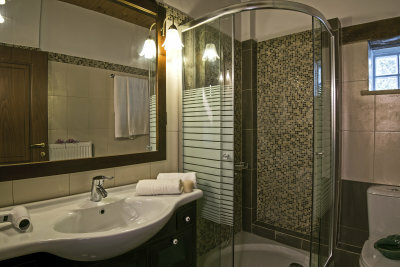 In jeder Etage ist jeweils auch ein komplett eingerichtetes Badezimmer, unten mit Dusche + Waschmaschine, oben mit Wanne. 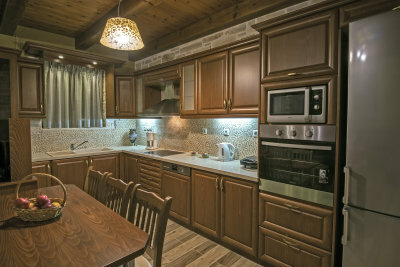 Küche, Eßbereich und Wohnzimmer sind in offener Bauweise in Parterre. Vorhanden sind auch 35 m/2 Pool (mit separatem Kinderteil) , Grillplatz, Sonnenterasse mit Liegen + Sonnenschirmen, 2 Parkplätze. PREISE nach Termin und Gästezahl incl. Klimaanlagen in den Schlafzimmern,Safe, WLAN Verbindung, Babybett, Bettwäsche, Handtücher (nicht für Pool + Strand), Strom, Wasser, Reinigung & Endreinigung – SAISON 01.04. – 15.11. 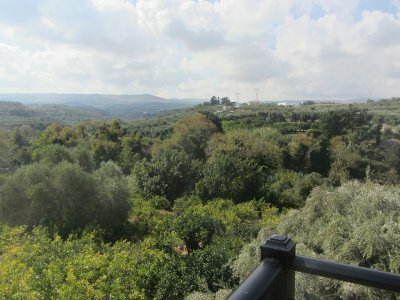 The surrounding of the village are olivegroves down to the sea. 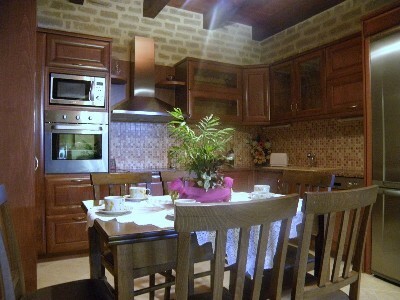 In the village there are 1 traditional restaurant, 1 cafenion and a minimarket. 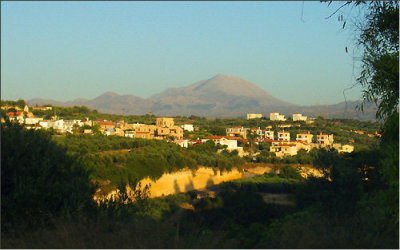 In a distance of 2,5 km you find traditional Cretan restaurants, 2 supermarkets, baker, pharmacy and a petrol station. 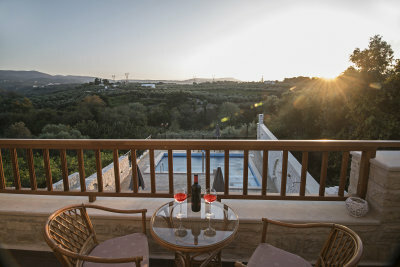 The 140 m / 2 home is located in the lower part of the village in the area of ​​extensive olive groves that surround the area, on a 1000-m / 2 site, and is 2.5 km away from the 1 km long sandy beach of Chrisi Amo in Sfakaki. 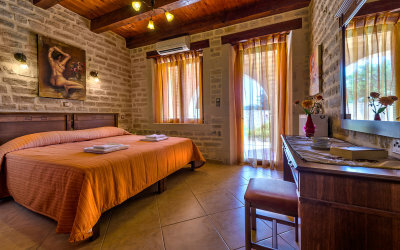 It is suitable for 6 guests (+ 1 baby under 2 years is possible ) and has 3 double bedrooms (all with free air conditioning), one room situated in the ground floor, the other two on the 1st floor. 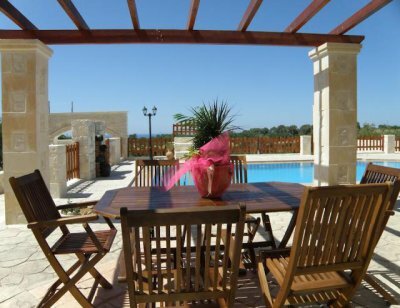 There is also a 20 m / 2 terraces and 2 balconies. 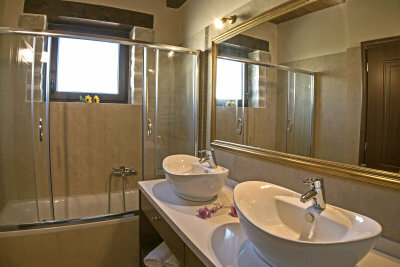 In each story, is also the one full bathroom, downstairs with shower and washing machine, top with tub. 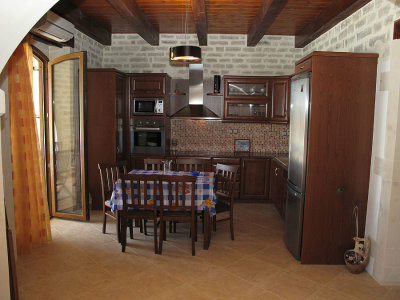 Kitchen, dining area and living room are in open style in the ground floor. 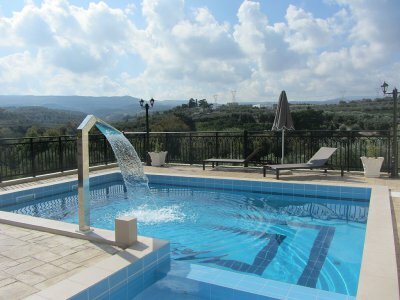 Available are also 40 m / 2 pool (with separate children's section), barbecue, sun terrace with loungers + parasols, 2 parking spaces. Heating available (for a fee on the spot). If you are traveling with children, we are interested in the age of children at arrival. Are you traveling with pets, we want info + details about the animals.